These past few months, we have been able to celebrate some of our favorite people - Moms and Dads! A big thank you to all the moms and dads out there for all that you do today and everyday. We hope you enjoyed celebrating your special family members as much as we did. During this busy time of year, it can be a challenge to check in with family members. Scheduling a family meeting is a great way to get everyone together to discuss upcoming family events, problem-solve challenges, and practice great communication skills. Use this guide, from FOCUS, to set up your successful family meeting this week! The end of summer and the start of a new school year can be a tough transition for kids. Check out these tips from FOCUS to help get next year off to a great (and GREEN) start! Every family encounters problems big and small. Setting time aside to discuss problems and solve them together as a family is a key element in strengthening family closeness and resilience. 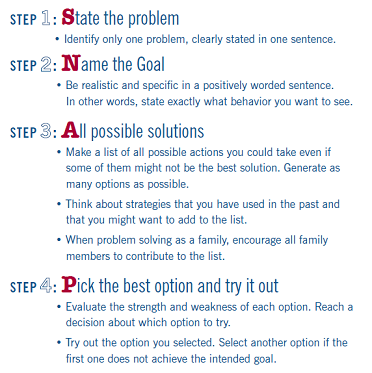 In FOCUS, we use SNAP as a step-by-step way for families to find solutions to problems they might be having. Involving kids in problem-solving, when appropriate, is also a great way to help them feel important and involved with the family as a unit. Trying out SNAP is easy!